name notes "the Football League read his signature incorrectly and he was registered as Ivor, by which name he has been recognised ever since." Birth 18 December 1922 in Isle of Dogs, London [registered as Ivan, in Poplar, March 1923]. Marriage to Joan Hendrie [registered in Carlisle, Cumberland, June 1948]. Club(s) His early playing career saw him playing with Finchley FC and Northfleet FC, and back at Finchley FC again. He assisted Tottenham Hotspur FC and Millwall FC during WW2, both as an amateur. He then became the youngest player-manager ever when at Carlisle United FC from August 1946, he was only 23 years old. After 91 league appearances and 52 goals, he left on 31 January 1949, but still registered as a player, he sold himself to Sunderland AFC for £18,000 claiming that it was in the best interests of the club that he leave, providing Carlisle with suitable financial reimbursement for the transfer, and a record fee for a Third Division North club (Sunderland had attempted to buy him on 17 January 1948 for £10,000). 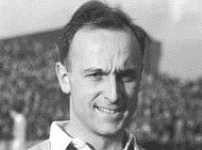 Following 71 league appearances, in which he scored 25 times, Manchester City FC paid £20,000 to take Broadis on 5 October 1951, beating offers from Leeds United AFC and Liverpool FC. He made 74 league appearances and scored ten goals for City. Another £17,000 in transfer fee's took him to Newcastle United FC on 29 October 1953, despite a �22,000 offer from Notts County FC the month before for him who became the their player-manager. Broadis wanted to join Arsenal FC. He made 42 league appearances for United, scoring fifteen goals. On 29 August 1955, after being transfer-listed, Broadis returned to Carlisle United FC as a player-coach, for £3500 and made another 159 league appearances, scoring 32 goals. Broadis made a guest appearance for Third Lanark FC in the 1956 Glasgow Cup Finals. He joined Scottish club, Queen of the South FC in June 1959 as Captain. He retired from playing on 28 July 1961 after 63 Scottish League appearances, where he scored another twenty goals. He carried on coaching for another three. Distinctions Broadis is officially the first ever manager to transfer himself to another club, after being the Football League's youngest ever manager. Height/Weight 5' 9", 11st. 0lbs . Player number One of two who became the 713th players (714) to appear for England. First match No. 268, 28 November 1951, England 2 Austria 2, a friendly match at Empire Stadium, Wembley, London, aged 28 years 345 days. Last match No. 290, 26 June 1954, Uruguay 4 England 2, a World Cup Finals group match at Sankt Jakob Stadium, Basel, aged 31 years 190 days. Member of the RAF during WW2. Though never partook in any bombing missions. He hung up his boots in 1962, choosing to take up a career in journalism, reporting for the Carlisle Evening News and Star, and for the Observer. - An English Football Internationalists' Who's Who. Douglas Lamming (1990). Hatton Press, p.47.